Equip:Increase critical strike rating by 84. Equip:Your harmful spells have a chance to increase your spellpower by 590 for 10 secs. Comparison note: this item is 10% chance on hit. Sextant of Unstable Currents is 20% chance on *crit*. This item is from the badge vendor, so anyone can pick it up. Sextent can proc on heals, this trinket does not. This trinket has a 45 second cooldown on procs, with a 15% chance to proc outside of the cooldown. Does it Procc on only Direct Damage or on Damage over time aswell? Does this proc of heals aswell? Wouldn't this be a decent holy paladin trinket seeing we have to judge every now and then? You'd be better off with the AP equivalent of this trinket. So, this has no internal cooldown? If not, can you stack with other trinkets of equivelant effect? Insanely nice trinket, and most obviously one of the best pre-raid trinkets in the game. Just something I've noticed today: Although the Sundial's proc appears to stack with on-use trinkets, you'll only receive the bonus spellpower from the proc with the biggest bonus. So, on boss fights I've been waiting for the Sundial proc to use any on-use spellpower trinkets after the proc wears off. Just like to add, it procs when i am tailoring, all that extra spell power comes in handy trying to get rid of any creases in the fabric. so i think the SP stacks..
well doesn't matter anyways. the proc does stack with other on use trinkets, a few times i've noticed a lot of buffs blinking away on my buff section. this trinket + bloodfury racial + USE:http://www.wowhead.com/?item=44013. so i natuarally checked my character pane to see what my stats were like with these buffs up. i had 3k spell power. so pretty conclusively yes it does stack with on use trinket buffs. not sure about proc trinkets though. A GM has confirmed to a pally in my guild that this trinket currently (as of 12/3/08) does NOT work under ANY circumstance for a paladin. Not even for Judgements. Save your badges, pallies, unless you really need the crit. This is another example of why Blizz wants to screw us over. Just read a Blue post the other day about how Judgements are supposed to be this weird hybrid power of spells and melee, which means they 2x crit but have low range and don't work when you're silenced. It appears that Blizz is being rather selective on which items trigger Judgements as spells and which trigger as melee. Sigh. This trinket DOES stack with other proc trinkets as well as on use trinkets. For example the and this one have both procced for me at the same time meaning they have independent internal cooldowns and giving me +1102 spell damage that i saw on my character sheet. CONFIRMED: This trinket proc stacks with other trinket procs, such as Forge Ember. As a mage I hate the randomness of this trinket. Really looking forward to an upgrade hex head, or even the dragon soul. Does anyone know if this trinket procs on a DoT effect. Like Corruption or Siphon Life? And if it does, only when you cast the spell or also when it deals damage? I regret spending 40 badges on this thing. Save your badges for the T7 badge gear, really. I´m a warlock, 0/41/30 spec btw >_>. Does it proc on pladin Consecration ? Read the above comment by Khaaan. It supposedly does not work for paladins. Sounds like it procs off all non dot spells. I'm not sure how extensively you have tested this I would have assumed it would only proc of casting dots rather than when they deal damage but it seems odd that it wouldn't work at all. I may try and test this myself. I'm pretty sure this procs when casting curse of elements and corruption, tested in instance. As the tooltip clearly says; it can increase spelldmg from casting a harmfull spell, it does NOT say that the harmfull spell needs to hit, unlike some other trinkets do, so even if your spell gets resisted it might still proc. Now is the time to do some serious damage! 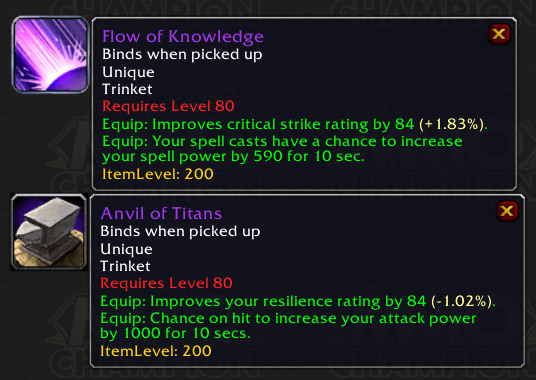 I tested this trinket + Flow of Knowledge from the wintergrasp vendor and they don't share an internal CD but when one procs over the other it just refreshes the last ones duration. Now I wish I had Dying Curse to test because that is an entirely different proc, where as this is the exact same proc, name, everything. I noticed a coment from beta saying there's a 45 secs cooldown to the proc, is it stilll in place as of live? WHO is "The Exiled"? Sargeras? Kael'Thas? Medivh? This is so not true.. The first minute i had it I did concecrate and bam, it procced. so is this the best badge trinket for a mage at this point? worth spending the emblems on? That's insane that such calculations are required to play this damn game. Also procs rom Spellsteal, Counterspell and Polymorph. The proc does at least stack with the effect of Mark of the War Prisoner. Both buffs appear and combined spellpower appears on the Char sheet. Altso the dmg of my spells reflect that they do indeed stack. I have normaly 1800ish spellpower. Highest Ive seen with both the trinkets and some other buffs is 3000ish, followed by two concecutive 8800 shadowbolt crits. Does not stack with Flow of Knowledge. Think it's worth replacing Jet'ze Bell with this? So a huge disappointment for mages - this trinket will not proc on Blizzard or Flamestrike AOE spells. It will proc on Arcane Explosion. This is a huge drawback for all the aoe'ers in Lich King heroics and raids, and I was really disappointed to find it out in testing. It has undeniable crit value, but just fair warning to those who read "damaging spells" to mean "all damaging spells" as this isn't truly the case... *sigh*. this badboy proc's off of any spell by my experience. I am a warlock, so I don't have any direct healing spells. I have had it proc off of creating a bandage, creating bolts of cloth, creating engineering items, fel armor, detect invisibility, as well as dots and direct damage spells. It does not proc off dot ticks, only initial casting of the spell. I'd just like to point out that this does NOT stack with Flow of Knowledge because they have the same bonus, it does how every stack with anything with lower or higher bonus.... though I haven't seen anything implemented with more bonus spellpower than this one. can and proc at the same time? or do they share a cool down and thus make the 2nd one useless? This trinket does NOT proc off of a paladin's Judgements or Consecrate. It DOES proc off of Holy Shock casts, but only if you cast it on an enemy. If I had to guess, Kel'thuzad. He exiled himself from the Kirin Tor, choosing to practice Necromancy, an art that was not accepted by the Kirin Tor at the time. It procced on cast, not on DOT ticks. Also, I had my imp Firebolt a dummy for 2 minutes - no proc, so pet spells don't count. I didn't have the patience to test Haunt, nor the shards to test Shadowburn, but it's safe to assume that both of these will proc it. I also didn't test any fire spells, but again, they're a pretty safe bet. Didn't proc off of Fel or Demon Armor. It also didn't proc from wand damage. In case you were wondering. Well, since it is Dalaran, let's assume it's a member of the Kirin'tor. -Medivh was never technically a member, and distanced himself on purpose. -Kael'Thas was never officially shown as having been exiled. He left to help his people, and went nutso while away. If he had returned, it's possible he would have been exiled, but I think we can count him out. Thats really all of the mages of Dalaran that I can think of that might in some way fit the description. Likely, it's just a cool name. Might it stack with Embrace of the Spider? That would be very nice and it seems like it would. Edit: Tested, They in fact do NOT share an internal CD and can proc at the same time. Would it be worth it for me to equip two of these for the crit bonus, even though the proc won't stack? Or should I get one and wait for Embrace of the Spider from Maexxna? One of my favorite trinkets I've encountered so far. Cheers. So does this proc off Penance or no? If it does, this is a lot better than the badge egg imo. Add this proc to the spellstealable Aura of Arcane Haste (max 1 minute though) from Mage Hunter Ascendants for a total increase of 1090 spell power, plus 50% haste. A very good trinket to have, every mage should try and get this before they start 25 mans and EoE10. The post above said it will take 10 spells on average to proc this (after the cooldown expires). This is incorrect. Assuming 10% chance of it proccing with each spell, there is thus a 90% chance that it won't proc. Thus, if you cast 7 damaging spells, more often than not it will have procced already. Therefore the average is 7 spells, not 10. This does not take into consideration latensy. 590 * 10 / (45 + 10 * 1.5) = 98 spell power. 590 * 10 / (45 + 7 * 1.5) = 590 * 10 / (55.5) = 106 spell power. Thus, this item has the potential to be, theoretically, the equivalent of up to 106 spell power. Of course spell duration and latensy and anything that prohibits you from casting during the 10 second buff will reduce the effectiveness of this item. I like the "stacking with" comments, as its helpful as to what trinkets to pick to wear. No point in having the two if they keep cancelling each other out and what not. I used Serrah's Star and Sundial of the Exiled and they both can trigger at the same time. Stacks with Abyssal Rune, they're nearly the same, except 1 has crit and 1 has haste. Sorry, but you have confused 'median' with 'average'. About half the time, you will get a proc in 7 casts, but some 4% of the time, it will be at least 30 casts! Over the long run, it will take 10 casts, on average. This trinket will proc off non-healing spells of all sorts. It is not an unreasonable trinket for discipline priest healers, as it will proc off pw: shield. So... during Nefarian's Priest call, could this proc? Procs off of Sacred Shield, and of course Holy Shock when used aggressively. Wasn't working on Judgments for some reason (probably because they are more ranged attacks than spells). Meteorite Whetstone works on Judgments however, if you have it laying around and don't have this trinket yet. Worth every last badge, quite possibly one of the best mage trinkets in the game so far. As if the pretty frequent proc of massive proportions isn't enough for you, it comes equipped with a large amount of crit rating. Any mage, and most casters, should get this trinket as soon as they can. Was wondering which would be the best between this and Talisman of resurgence? 1) It is indeed a 10% chance. 2) This does not mean that you will average 10 casts outside the ICD before you will see it proc. Several people in this thread have said this with confidence. I can understand how a high-school understanding of math could lead to this shorthand conclusion, but it's wrong. In short, each cast has the same amount of chance to proc the effect, so you can't take an arithmetic average of those. It would always equal the median between the cast that actually did the proc in your test. You have to take the average of the entire distribution of the chance that the trinket will NOT have proced by the Nth cast. Since there's always the same chance on the next cast that this trinket is not going to proc, this means there's some chance for a long series of no procs, and you will never get to 100% even with an infinite number of casts. Therefore, the calculation requires an integral. And sparing you the written math, this calculation works out to be about 7.78 average casts between procs. This may be why this trinket is procing more often than expected. It's the expectations that are wrong, not the proc. 3) I may have just won the nerd of the year award by using calculus in WoW. I read about it stacking with other trinkets , but does it stack with trinkets that have the same buff? Such as Flow of Knowledge? procs of Life tap aswell..
Might it be a refference to Gandalf saying "Now is the time!" in 1st book of "Lord of the Rings"? It is said in chapter "The Bridge of Khazad-Dum" when Gandalf is hastening the fellowship to flee, when they were flying from the orcs in Moria?